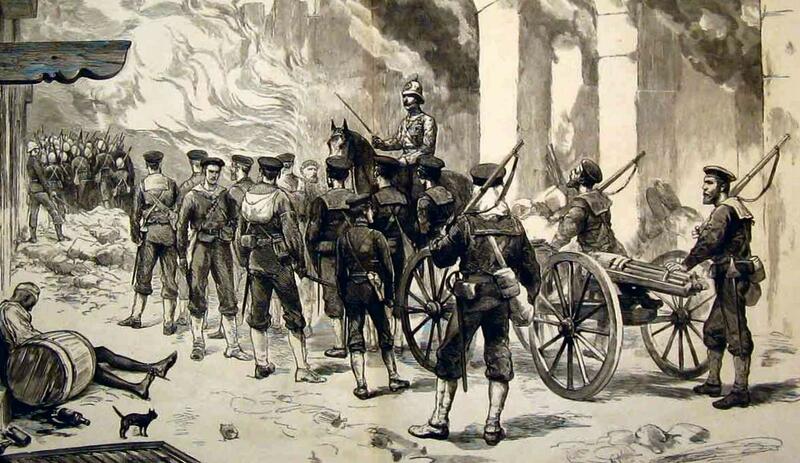 Throughout the nineteenth century the Royal Navy had a strong tradition of landing “Naval Brigades” in trouble spots – invariably succeeding brilliantly. Trouble often flared up in remote locations, to which sending Army units would be slow and difficult. The Navy was in a position to land ad-hoc forces made up of marines and bluejackets. This article was originated as an answer to a reader. Question from “Gentian”: Dawlish seems to be pretty comfortable fighting on shore – he was an officer in the Navy – how come he seems to be able to fight so well on land? Answer: Though the above question was asked by a reader of Britannia’s Wolf it is equally relevant to Britannia’s Reach, in which Dawlish is again involved in battles on land as well as on water. The answer is that from his entry into the Navy in 1859 Dawlish, like other officers and ratings of the time, was trained to fight on land as well as sea. His skill as a horseman, learned in boyhood, proved an extra advantage. Throughout the nineteenth century the Royal Navy had a strong tradition of landing “Naval Brigades” in trouble spots – invariably succeeding brilliantly. Trouble often flared up in remote locations, to which sending Army units would be slow and difficult. The Navy was in a position to land ad-hoc forces made up of marines and bluejackets and to facilitate this most ships carried light field-guns, typically 9 or 12-pounders. These were designed to be broken down into their components – barrel, wheels etc. – for easy transport and easily reassembled for action. 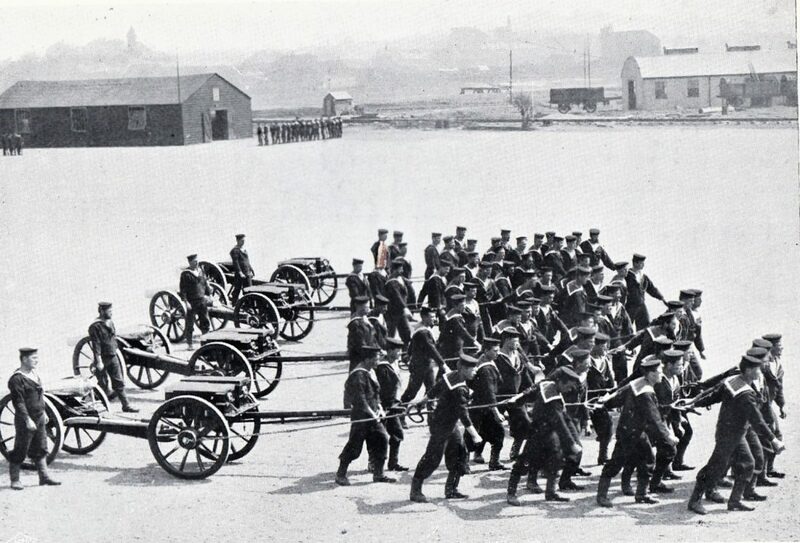 Such Field-Gun Competitions are still held in the Royal Navy, with teams competing for the Brickwood Trophy, and can be witnessed at public displays. Gatling, Gardner or Nordenvelt semi-automatic weapons were also employed and, later, the fully automatic Maxim. 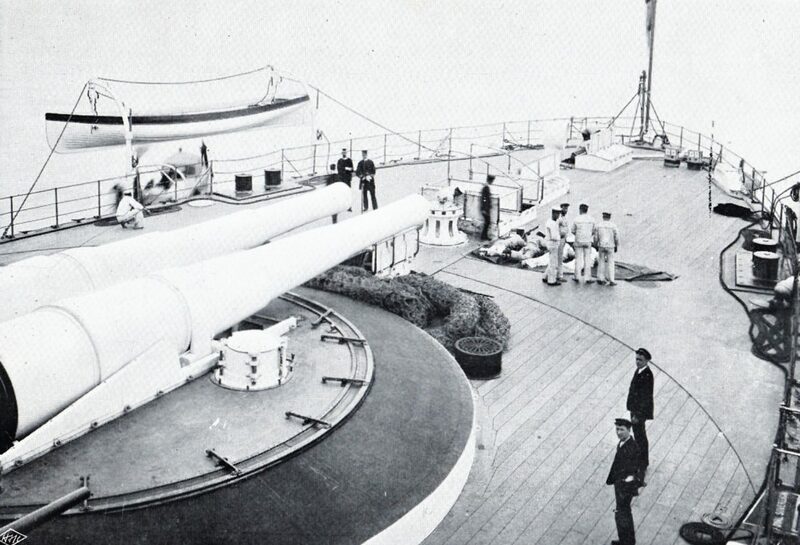 In addition to such light weapons considerably larger ordnance was sometimes also landed, most notably the two 4.7” guns from HMS Powerful and HMS Terrible which were mounted in improvised carriages and which played a key role in the relief of Ladysmith in 1899 during the Second Boer war. Seamen, no less than marines, were trained in musketry and their skill with the cutlass – a fearsome close-quarters weapon – was legendary. Seamen’s familiarity with blocks and tackles made them especially valuable when transporting equipment across obstacles and ships’ carpenters were capable of taking on any challenge from constructing gun carriages to building bridges. Though there were too many such Naval Brigade operations to be listed here the most spectacular were those which served in The Crimea (1854-56), the Indian Mutiny (1857-58), the Ashanti War (1873-74), Alexandria (1882 – see illustration above), the Gordon Relief Expedition (1885) and the Boxer Rising (1900). 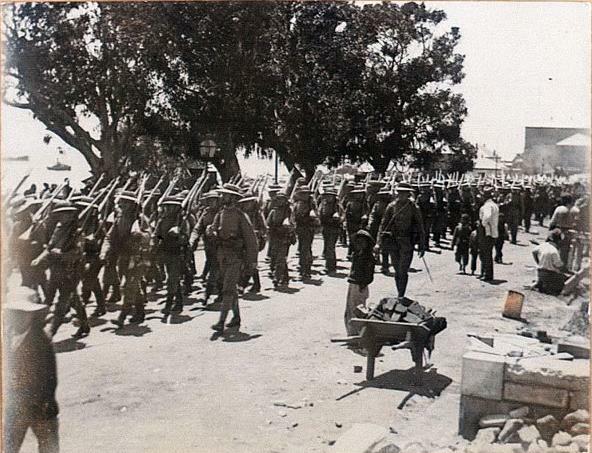 During the Abyssinian campaign of 1868 the only body of men in the whole army which arrived at Magdala, after a toilsome march of 400 miles across the mountains, without a single man falling out for any cause, was the Naval Brigade. There were literally dozens of smaller actions. Particularly notable was the Benin Expedition of 1897 which was almost an entirely naval “show” without Regular Army participation. 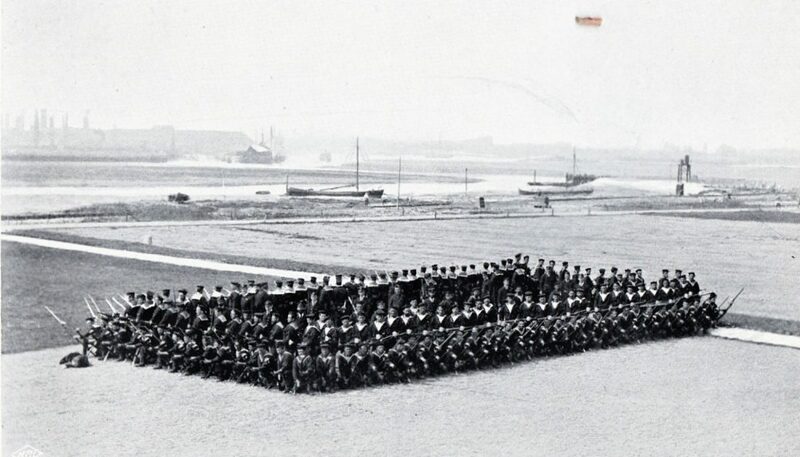 In the 1890s a large Royal Navy vessel – such as an “R-Class” battleship such as HMS Royal Sovereign – was capable of landing a “Battalion” of four “Companies”, with sixty men in each. Two 9-pounders and two Maxim machine guns, all on field carriages, were available to land with them. When fully accoutered the men carried rifles, ammunition pouches, water bottle, haversack, blanket and entrenching spade. 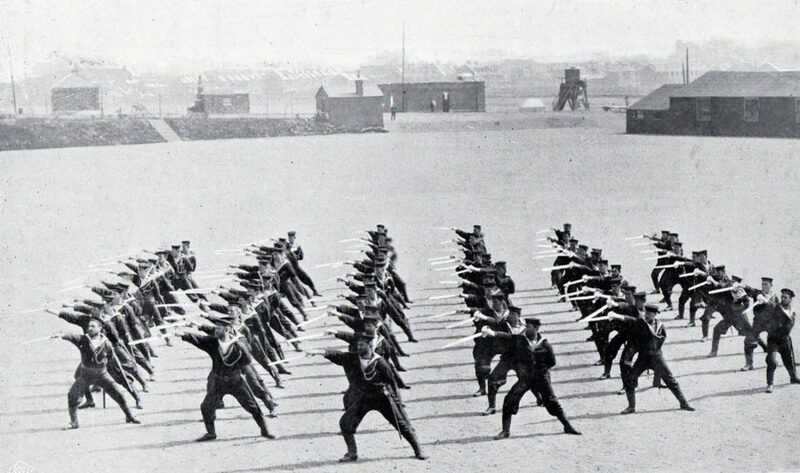 They were trained to carry out regimental attack and defence manoeuvres – as the dramatic photograph below illustrates “forming square” to repulse cavalry. Equally important was proficiency in rifle shooting, practice at sea being made possible by use of the “Morris Tube” calibre-adapter which allowed miniature rounds to be used in the standard rifle of the time, the .303 Lee-Metford. 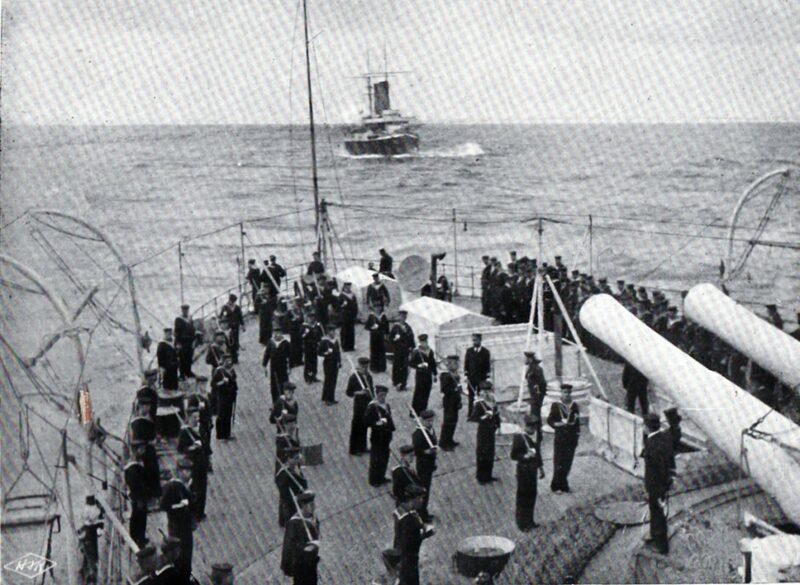 A photograph below shows such practice on the quarterdeck of HMS Royal Sovereign (1891). The cutlass, the weapon most closely associated with the British bluejacket, was still considered a useful weapon. A photograph below, taken on the restored HMS Warrior at Portsmouth, shows them stowed on a deckhead. They are surprisingly short weapons by comparison with a sword – probably from having been initially designed for use below deck in boarding operations. 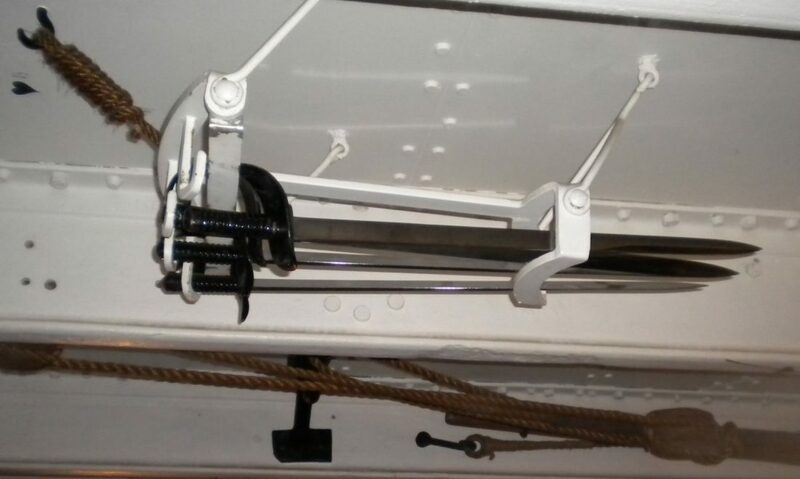 The “stamp, thrust and hack” associated with its use must have been terrifying at close quarters and regular exercising was a normal part of every ship’s routine.